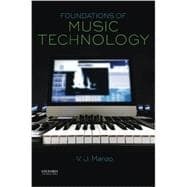 Foundations of Music Technology explores the core concepts of music technology and its uses as a mechanism to facilitate musicianship in a way that is accessible to all students--from the musician with limited technology skills to the technology expert with little knowledge in music notation. The text uses a free, customized software application for Mac or PC in order to demonstrate fundamental concepts of music technology germane to all professional applications like recording, synthesis, digital notation, MIDI, automating effects, acoustics, and more. With the concepts grasped using this "software-independent" approach, students can then transfer those learned skills over to the software of their choice. V.J. Manzo (PhD Temple University, M.M. New York University) is Assistant Professor of Music Technology and Cognition at Worcester Polytechnic Institute (WPI). He is a composer and guitarist with research interests in theory and composition, artificial intelligence, interactive music systems, and music cognition. V.J. is the Oxford University Press author of the books MAX/MSP/Jitter for Music on developing software-based interactive music systems and coauthor of Interactive Composition: Strategies Using Ableton Live and Max for Live. For more information, visit his website vjmanzo.com.